As part of the C.O.N.T.A.C.T. 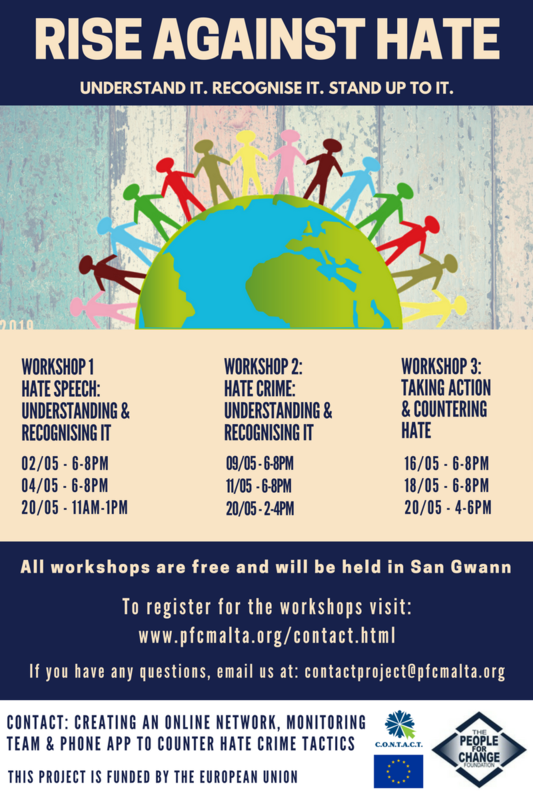 project (Creating an On-line Network, monitoring Team and phone App to Counter hate crime Tactics), The People for Change Foundation is currently offering a series of three workshops tackling the issues of hate speech, hate crimes, and counter tactics against them, both on and offline. We offer three different workshops that can be held separately or in one session; each section is about two hours long. The first workshop focuses on hate speech, and covers how to define it and how to recognise it in ambiguous situation, as well as discussing if and how legislation can sanction hate speech without limiting free speech. The second workshop focuses on hate crimes. It covers what hate crime is and how to recognise it. The third and final workshop focuses on practical counter strategies against hate speech and hate crime. The facilitators help participants to elaborate practical and effective counter hate strategies, according to abilities and priorities, and whether they act as individuals or as associations. Project Partners: The UK Race and Europe Network (UK), The Hellenic League for Human Rights (Greece), AEQUITAS (Cyprus), QVORUM Institute’s (Romania), Ce.S.F.Or (Italy), Assocacion Socioeducativa LLERE (Spain), University of Southern Denmark, European Humanities University (Lithuania), University of Lodz (Poland), University of Malta and The People for Change Foundation (Malta). The project monitors and reports on hate crime and hate speech in ten EU countries (Cyprus, Denmark, Greece, Italy, Lithuania, Malta, Poland, Romania, Spain, and United Kingdom). To this aim, it conducts research and training activities with the cooperation of project partners. In particular, this project involves comparative analysis of hate crime incidents, public awareness-raising activities on hate crime as well as the development of teaching modules for university courses and training materials for law enforcement officers and media practitioners. It makes use of innovative methodologies to denounce and monitor hate crime incidents (i.e. a web platform, an online crime reporting tool and a mobile application). The data collected will be invaluable in informing policy development. The main target groups of the project include youth, media as well as legal and law enforcement professionals. To promote cooperation across the European Union and among a variety of stakeholders against hate speech/crime. Hate incidents, especially online, are increasing in most countries. Besides, far-right and extremist groups and political parties are rising in Europe and inducing hatred against certain groups of people. Racist incidents, hate crime and hate speech have severe negative impacts on the victim. However, research shows that in the EU hate crime is often not seen as a serious offence, which contributes to a significant under-reporting. Definitions of what constitutes a hate crime differ from country to country hindering the efforts to fight against it even further. The EU has set a minimum standard to combat hate crime through its legislation, which is contained within the Council Framework Decision 2008/913/JHA. This Act compels EU Member States to punish intentional hate conduct against an individual or a group on the ground of race, color, religion, descent or national or ethnic origin. Some Member States’ national legislation go beyond this EU standards to offer greater protection to victims of hate crime. The People for Change Foundation (PfC) is the local project partner responsible for conducting the project activities in Malta together with the University of Malta. The PfC is primarily responsible for the organization of workshops and training sessions addressed to law enforcement officers, young people and media professionals. This project is closely linked to other initiatives PfC is conducting including Report Racism Malta, and advocacy activities for the promotion of human dignity on online news portals.